Bokurano: Ours (ぼくらの, Bokura no, lit. 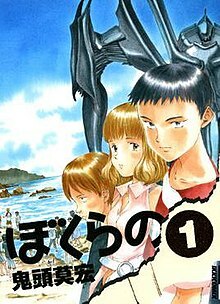 "Our") is a Japanese science fiction manga by Mohiro Kitoh that was serialized in the monthly manga magazine Ikki from 2003 to 2009; 11 tankōbon have been published by Shogakukan. It is about a group of middle-school students who unwillingly assume the task of piloting a giant mecha named Zearth in a series of battles against mechas from parallel worlds, where the survival of Earth is dependent on their continuing to win at the cost of the life of the pilot of each battle. Each story part of Bokurano: Ours tends to focus exclusively on one character – the next pilot. It starts with some background information on the character and their underlying motivations while building up to their battle. The episodes themselves are named after the character currently being focused on. During a summer camp, 15 children; 8 boys and 7 girls, find a grotto by the sea. Deep within they discover working computers and some electronic equipment, and later the owner, a man who introduces himself as "Kokopelli". Kokopelli claims to be a programmer working on a brand new game, in which a large robot has to defend the Earth against fifteen alien invasions. He persuades the children to test the game and enter into a contract. Fourteen of them agree, but one of them is kept from entering the contract by her older brother, and a moment later they all mysteriously awaken on the shore, believing what happened was just a dream. That night, two giant robots appear by the beach. A small creature calling himself "Koyemshi" also appears and claims to be the children's guide. He then teleports them into the black robot, with Kokopelli already inside and controlling the black robot in order to defeat the white enemy robot. During battle, he gives the children a brief tutorial on how to pilot the robot as he destroys the enemy. Once he has finished, he tells the children that they are on their own now and sends them back to the beach. As the children are teleported out, one child observes Kokopelli whispering "I'm sorry". Takashi Waku is the first pilot of the robot, which is named "Zearth" by Maki Ano. Upon winning the fight, Waku is accidentally 'knocked' into the sea from a ledge on Zearth's chest by Jun. The second pilot, Masaru "Kodama" Kodaka, dies unceremoniously after defeating his opponent. Koyemshi explains to the children that Zearth runs on life force, and the cost of every victory would be the life of its pilot. It is also revealed that Waku had fallen into the sea after getting 'knocked' by Jun because Zearth had drained his life force; he was already dead. The next two pilots, Daiichi "Daichi" Yamura and Mako "Nakama" Nakarai, lose their lives similarly. Daichi protects an amusement park so his siblings can go there and Nakama uses Zearth's abilities to help save a classmate of hers. Before her victory death, Nakama manages to give the others some pilot costumes that she sewed herself. Through Takami "Komo" Komoda, the military finds out about the children's connection with Zearth, and they are brought together for their own protection. The next pilot, Isao Kako, becomes too scared to fight. When he becomes too unstable, Chizuru "Chizu" Honda kills him, and becomes the next pilot for the fight. Before fighting the enemy robot, she seeks out her revenge on the teacher and his friends who had abused her sexually. After killing his friends and while attempting to kill him, she is stopped by her sister, who is revealed to love him despite everything he did. Both her life and her unborn baby's life are taken as Zearth's payment, revealing that there is another person besides Kana Ushiro, who is exempt from the contract. During Kunihiko Moji's fight, it is revealed that Zearth's cockpit looks just like their enemies' weak points. Maki, the next pilot, realizes that they are in an alternate universe for her fight when an unknown fighter jet attacks them. She pries open the enemy's weak point and reveals the human pilots inside, confirming the revelation. Koyemshi then explains that these battles are meant to weed out parallel universes; In order to bring more diversity to the multiverse as a whole, countless parallel universes that have few differences from each other are forced to fight for the right to exist in a battle of survival of the fittest against other universes through these battles, with the loser's universe being completely erased from existence. Kirie is the next to pilot Zearth, although he is reluctant to fight against other humans for the survival of their world due to his views on the importance of life. He later attacks the teacher who had abused Chizu. After receiving some words of wisdom from military officer Misumi Tanaka, during his fight, he reveals himself to the opponent to show that they are themselves human. The opposing pilot, a girl, does likewise, showing him the many cuts and slits along her arm. After this moment, Kirie finally finds his resolve to fight and defeat the enemy. Takami is the next pilot, but the enemy gains the upper hand during her fight. However, when the enemy pilot discovers that Takami is the same age as his recently killed daughter, he abandons his robot and runs away, hiding in their world. The Japanese government sets up a plan to lure him up to a piano recital held by Takami after revealing to the world some bits of information regarding Zearth and Takami as its pilot. In the end, the enemy pilot attends the recital and is so moved by Takami's performance that he allows himself to be killed by her father a few minutes before the time limit. During Anko's fight, Anko's father, a newscaster, and the military attempted to fabricate a story about Zearth and the children to soothe the public opinion, despite being preempted by Karita, a boy who appeared on TV falsely claiming that he was a Zearth pilot and whose comments raised the public opinion's hate for Zearth, resulting in his assassination. Afterward, Anko's father received an authorization to broadcast his daughter's battle from inside the cockpit of Zearth to the whole world. Even when seeing Anko in grave danger as the acid flowing from enemy's piercing needles managed to breach the cockpit, almost killing her and Machi, her father did not stop the transmission despite objections from the others. However, after sending these images to the world, messages supporting his daughter came to the station and he used them to encourage her to fight back. She managed to turn the tide of the battle by using the same needles the enemy robot pierced at Zearth's body to knock it down, allowing her to remove the enemy cockpit. After sending a message to the world apologizing for the casualties that occurred during Zearth's battles, Anko sealed her victory by destroying the enemy cockpit, and died in her father's arms. Thanks to Anko's declaration, the army managed to create its official version of the story, claiming that Zearth's only pilots are Komo, Anko and the deceased Karita, in spite of all three now being dead. Before Kanji's fight, he discovers that Jun, the older brother of Kana, is the one who is exempt from the contract. His own opponent is by far one of the strangest encountered, as it first launches needles onto Zearth and the battlefield before flying to Hawaii, then starts firing shots across the Pacific Ocean at Zearth, using the needles it launched at the start of the battle as markers. After Japan attempts to defeat the enemy with a nuclear bomb and fails, Jun suggests to Kanji to use the lasers to target the enemy. Although Kanji could not directly target the enemy, a human soul could be used as a target, and military officer Masamitsu Seki immediately volunteers. Koyemshi teleports Seki and 22 soldiers to where the enemy is, and Seki valiantly reaches the enemy in time for Kanji to fire, thus defeating it. After the victory, Kanji requests Koyemshi to teleport him to the top of the Chūtenrō tower where he contemplates who the next pilot will be in his final moments. It is later revealed that Kana is the next pilot, as she actually entered into the contract after Kokopelli's battle, before the children discovered the consequences of it. Despite being considered too kind to harm others even at the cost of herself, she stood a chance in the battle as younger the pilot, stronger is the vital energy provided to the robot, thus increasing its capabilities. To aid Kana in her battle, and foreseeing a battle outside their home world, Misumi convinces Koyemshi to allow an advanced fighter jet to be teleported into the cockpit, and uses it to shoot down the unmanned fighters deployed by the enemy world's army to help their robot. She ends up being shot down and, after ejecting, is captured by the enemy robot. Fearing Kana would stop fighting to not harm her, she ends up killing herself with her own gun, just after Ushiro is told that she is his real mother, who left him with Kana's father (an old teacher of hers) thirteen years ago, as she didn't feel she had the right to raise him herself. Soon after, Kana defeats the enemy. During the time between Kana's battle and the next, Machi is revealed to be Koyemshi's younger sister, a human girl from a parallel Earth. It turns out that because Kokopelli and Machi's home world's battle for existence was still taking place, Machi did not become a part of the contract since an individual cannot be part of 2 contracts at once, but Machi signs the contract with Jun after Kana's victory, agreeing to fight for her adopted Earth. She is shot in the head shortly afterward by a mysterious man and ends up in a coma; Koyemshi decided to end her life himself since he thought that it would have been the best choice. He then returns a version of Machi that already existed on this Earth, who was replaced by the Machi from the parallel Earth during the summer camp before she and the others went into the grotto and signed the contract, from the stasis she was in and with no memory of the previous events, to her family. In Jun's fight, the battle takes place on the opposing enemy's world. After a short battle, he defeats the enemy robot, but the pilot tricks him into opening the enemy cockpit which allows the pilots inside to be teleported away and hide among the population of their own world. Jun then has no choice but to kill everyone on the planet, and ultimately succeeds. Finally, rather than find a replacement pilot, and as an atonement to Machi, Koyemshi returns to his human form and enters into his supporting Earth's contract in order to participate in the 15th and final battle for its existence, which also serves as the tutorial battle for the next set of pilots of the next world: in effect, becoming the next "Kokopelli". The robots featured in Bokurano: Ours come in many different shapes, but all share similar traits. Each is roughly 500 m (1,640 ft) tall, layered with armor that can easily withstand all assaults from human weapons, including nuclear ones, without a scratch, and each has a panel with illuminated slits that represent the number of pilots, which go out as they die. Inside the robot, the pilots all sit inside a ball-shaped cockpit during each battle. This cockpit can be removed from the robot, allows the pilot operating the robot to view the battleground and/or anything on the planet that the pilot wants to see and it has custom-made furniture for each pilot to sit on, being created in the shape of a piece of furniture that the pilot's mind finds significant. Before a battle takes place, one of the pilots is chosen to operate the robot for the battle, and does so during the battle by simply thinking about what they want the robot to do, using their will to make the robot do it, as long as the robot's design allows it to be done. The robot's power source is the life force of the pilot who operates it during the battle; thus, the winning pilot dies after the battle. The main characters give the robot they are assigned the name Zearth. It is a large black humanoid-type with incredibly long arms and legs, and its hands can pry open the armor of other robots or impale them like spears. It has extremely thick armor compared to other robots, and it has the ability to jettison any part of its body in any way at will. It can not only locate any of its jettisoned body parts anywhere on Earth, but it can also sense the location of any human on the Earth as well, and that ability can be used to direct any number of its many lasers at any size population and/or any person that the pilot is familiar with, no matter where they are on the planet. The first enemy robot is faced by Kokopelli as a demonstration, and it is later named "Arachne" by the government. It resembles a spider with four limbs and can discharge electricity. The first enemy faced by the children is named "Bayonet", and it resembles a long sword blade with three edges at the bottom and a short claw-like appendage at the bottom of each edge. They also face "Cancer"; a large and round robot with three legs and multiple retractable whips, "Drum", a robot shaped like a giant layered cylinder that can rotate to roll against any surface and grind down armor, even in midair, "Enigma"; the first humanoid-type opponent that they face, "Fig"; a large bulb-shaped robot, with an elongated end that is connected to three limbs capable of launching it into the air and allowing it to hit Zearth like a wrecking ball, and "Gonta"; a robot shaped like a platform with two wide limb-like structures underneath it that tries to lure Zearth close by exposing its cockpit and then crushes the robot between them. They face the robot "Arachne II" on an enemy earth. Though it looks like Arachne, it can stand on its rear and spin rapidly to use its limbs as a buzz saw. They also face "Enigma II", another humanoid opponent, on another Earth. They face "Humbug" on their original earth. It is a humanoid robot with segmented arms that allows Zearth to remove its armor to allow a number of sharp wires to surround Zearth and pierce the cockpit. They also face "Idol"; a long and narrow-shaped flying robot with two wings and is capable of generating nails that secrete a dangerous solvent, and "Javelin"; a robot with two short arms and a large mouth that can fly and can shape-shift into a gigantic artillery cannon that is capable of firing at targets thousands of kilometers away by shooting markers. They face a two legged robot whose main body resembles Cancer both in shape and weaponry on an enemy Earth, and lastly, on yet another Earth, a humanoid opponent whose deranged pilot tricks them into opening their cockpit and allowing them to escape and hide among their Earth's population, forcing them to manually kill everyone on the planet. Bokurano is set in what appears to be either an alternate world, or one that resembles ours in the near future. There are some major differences from the real world—for example, Japan and the United States, rather than being allies, have a hostile, Cold War-like relationship. A treaty called the Treaty of Tianjin is mentioned that forbids the development of drones and other unmanned weapons. Bonus material contained in the collected volumes of the manga gives details on the vehicles and weapons that appear. The most significant ones include the "Type 88 Light Fighter", a canard-winged jet fighter that appears multiple times through the story as the main air defense fighter of the JASDF, the "Type 80 Support Fighter", a delta-winged ground-attack aircraft, the "Type 76 General Purpose Aircraft", a tandem-wing transport airplane, and the "Type 91 Guided Anti-Aircraft Missile". Other technologies briefly seen but not named include an American laser weapon mounted in the bomb bay of a B-52, and a Japanese aircraft carrier called the Akagi. Regarding differences between the stories in the manga and in the anime, Hiroyuki Morita, who directed the anime, wrote in his blog that he dislikes the original story and has, in some ways, been making changes to the plot for that reason. He also wrote that, at one point early in the development of the show, he asked manga author Mohiro Kitoh if he could find some way to save the main characters — the kids who must pilot Zearth. He wrote that Kitoh responded that his choice was fine as long as the changes did not involve "magical solutions" to the story. Morita closed out the blog entry with the statement "The director of the animated version of Bokurano dislikes the original manga. From here on out, you can't expect the animated version to expand on what you might find appealing in the original. So, fans of the original, please do not watch the animated version from now on". Bokurano: Ours was written and illustrated by Mohiro Kitoh. The first chapter was published in the January 2004 issue of the monthly seinen (aimed at younger adult men) manga magazine Ikki, where it was serialized until its conclusion in the August 2009 issue. Serialized chapters were collected in eleven tankōbon volumes published by Shogakukan. The manga is licensed for an English-language release by Viz Media, which began serializing it in the online English version of Ikki on July 23, 2009; the first print volume was published in February 2010, and the final volume was released in September 2014. [needs update] It is also licensed in French by Asuka, in Italian by Kappa Edizioni, in South Korea by Daiwon C.I., and in Taiwan by Ever Glory Publishing. A companion to the series, Bokurano Official Book (ぼくらの　BOKURANO OFFICIAL BOOK), was published by Shogakukan on January 30, 2008 (ISBN 978-4-09-188399-5). An anime television series adaptation called Bokurano was directed by Hiroyuki Morita and produced by Gonzo. It was broadcast in Japan from April 8 to September 25, 2007 Sun TV and Tokyo MX, as well as other stations. Episodes were released in Japan on eight DVDs between July 25, 2007 and March 26, 2008. On September 4, 2014, North American anime licensor, Discotek Media announced their license to the anime with an English subtitled DVD release in 2015. The original soundtrack is by Yūji Nomi. The opening theme was "Uninstall" (アンインストール, An'insutōru), and the ending themes were "Little Bird" (episodes 1–12) and "Vermillion" (episodes 13–24), all performed by Chiaki Ishikawa. Bokurano was also adapted as a light novel series entitled Bokura no: Alternative (ぼくらの〜alternative〜, Bokura no Orutanatibu). Five volumes written by Renji Ōki with illustrations by Mohiro Kitoh were published by Shogakukan between May 2007 and June 2008. This series has an alternate storyline, depicting most of the original characters from the manga accompanied by a handful of new ones, with the same task of piloting Zearth to protect the world at the expense of their own lives. ^ "The Official Website for Bokurano: Ours". Viz Media. Retrieved October 28, 2017. ^ "Bokurano Helmer Changes Story Due to Dislike of Manga". June 14, 2007. Retrieved June 14, 2007. ^ "Bokurano Manga Ends in Japan's Ikki Magazine". Anime News Network. June 26, 2009. Retrieved July 24, 2009. ^ "Viz Adds Bokurano & I'll Give It My All...Tomorrow Manga". Anime News Network. May 22, 2009. Retrieved May 24, 2009. ^ "San Diego Comic-Con International 2009 – Viz Ikki". Anime News Network. July 25, 2009. Retrieved July 26, 2009. ^ "Catalogue Classement séries A-Z Bokurano, notre enjeu" (in French). Asuka. Retrieved July 24, 2009. ^ "Autore > Mohiro Kitoh" (in Italian). Kappa Edizioni. Archived from the original on January 14, 2010. Retrieved July 24, 2009. ^ "Daum 책". daum.net. Retrieved April 13, 2015. ^ "ZEARTH 1(지어스) – Daum 책". daum.net. Retrieved April 13, 2015. ^ "Earth Defense teenager. Kito Mo Wang" 地球防衛少年．鬼頭莫宏 (in Chinese). Ever Glory Publishing. Archived from the original on February 23, 2012. Retrieved October 18, 2016. ^ "小学館：コミック 『ぼくらの　BOKURANO OFFICIAL BOOK』" (in Japanese). Shogakukan. Retrieved July 20, 2009. ^ a b ぼくらの：アニメ版公式サイト (in Japanese). Gonzo. Retrieved July 22, 2009. ^ ぼくらの：アニメ版公式サイト (in Japanese). Gonzo. Retrieved July 22, 2009. ^ "Discotek Adds Samurai Troopers, Bokurano, Comic Party, 3rd Lupin III TV Special". Anime News Network. September 5, 2014. ^ a b 小学館：コミック (in Japanese). Shogakukan. Retrieved July 20, 2009. ^ "小学館：コミック 『ぼくらの～alternative～ 1』" (in Japanese). Shogakukan. Retrieved July 20, 2009. ^ "小学館：コミック 『ぼくらの～alternative～ 2』" (in Japanese). Shogakukan. Retrieved July 29, 2009. ^ "小学館：コミック 『ぼくらの～alternative～ 3』" (in Japanese). Shogakukan. Retrieved July 29, 2009. ^ "小学館：コミック 『ぼくらの～alternative～ 4』" (in Japanese). Shogakukan. Retrieved July 29, 2009. ^ "小学館：コミック 『ぼくらの～alternative～ 5』" (in Japanese). Shogakukan. Retrieved July 29, 2009. Butcher, Christopher (March 30, 2010). "Bokurano: Ours Volume 1". About.com. The New York Times Company. Ellingwood, Holly (January 31, 2010). "Bokurano Ours Vol. 1 (Advance Review)". Active Anime.